_Do you have a Facebook fan page for your business, group, company, organization, or for what other reason you may need? Would you like to have a page more customized then the same old boring fan pages? Add customized tabs to your pages making your fan page a mini-website, or even use as your primary information location. 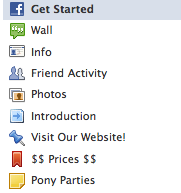 The possibilities are endless with customizing a Facebook Fan Page. Want your personal Facebook page customized? Have a custom Cover image made to advertise anything, or just make your cover a little more fancy then others.